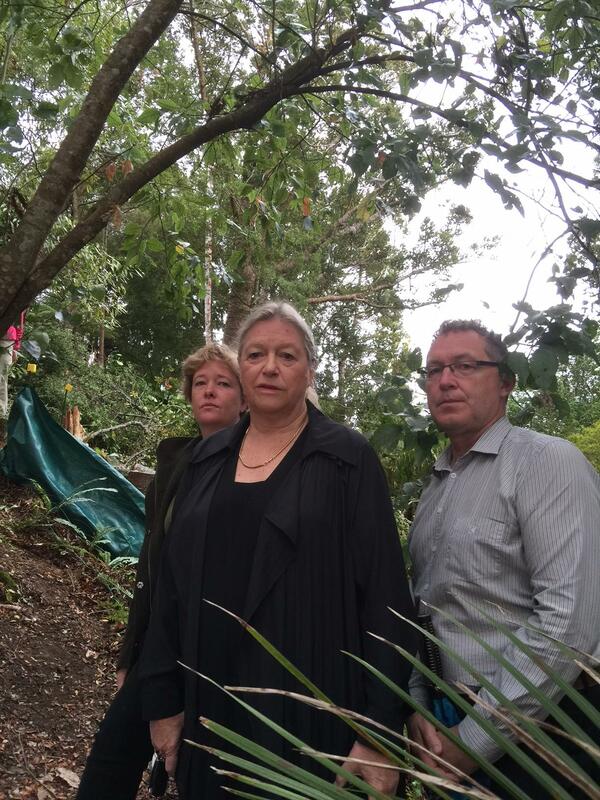 The fate of a magnificent Kauri Tree on a vacant section in Paturoa has received significant recent attention. If the wishes of the landowners are carried out the tree will be felled to make way for a new house. The tree is a magnificent specimen. Some have thought that it may be 500 years old. This may be an over estimation but there is no doubt that it is of significant age. To protect it a young man called Michael Tavares has set up house in the upper part of the tree. This promises to be a long drawn out and passionate fight to protect a giant of the forest belonging to a species endangered because of the ravages of Kauri die back. I thought that I should outline the Waitakere Ranges Local Board’s role. As portfolio holder for Resource Management Issues and as the person who submitted on one of the resource consent applications I am best placed to do this. We see the occasional consent application. Last term I would see one a month. This term we have increased the types that we want to see and I now see two a week. When we are consulted we are provided with a substantial amount of paperwork and asked to make comments within a few days. We did not see the application for 42 Paturoa Road. I learned of this application only because the matter was raised with me by concerned locals who had discovered the application. The decision on this application was not to notify it. We expressed concern at the use of the road reserve. We thought Auckland Transport should consult with us before consenting. We were worried at the number of trees being removed, particularly large Kauri although we noted the applicant had investigated alternatives. We were worried that the conditions relating to removal of the trees were not adequate to prevent the spread of Kauri dieback disease. We preferred that the application be notified. We fully supported the protection of the large Kauri on the road reserve. Looking back at the language I wish that I had strengthened it up. To be honest I did not appreciate that the large Kauri was a huge ancient Kauri. I have walked past the site many times and the road side Kauri are very prominent but this particular Kauri was less prominent. It is well down the slope and was surrounded by other trees that have since been felled. Its majesty has not been apparent until recently. I disagree with some of Auckland Council’s statements on the matter. The board was not consulted on the first application. The weight attached to our submission on the second is probably minimal and our desire for it to be notified was not followed. Iwi’s views were also not followed. We had a say but clearly our say did not influence anything. There are other concerning aspects of the consents. One site’s storm water conditions are less onerous than the second site’s and it makes you wonder if they will be adequate. The whole story shows the failure of the RMA reforms. Barely anything is notified now. Unless you have the resources and the skills such as the Paturoa residents then the first you may learn that a significant decision has been made is the sound of chainsaws cutting through native forest. And with Kauri facing possible extinction the last thing we should be doing is allowing the felling of large magnificent Kauri trees. Why aren’t these magnificent specimens scheduled?